Shaking hands are a real problem for some people and this steady spoon aims to help offset the effect of shaking hands. The steady spoon (there’s also a fork accessory) is designed to reduce the frustration of eating. It achieves this by compensating shaking movements by counter movement. A computer connected with sensors and powered by a rechargeable battery handles the compensation effects. Getting on a bit or dealing with the disease is not the most pleasant experience. It should not be embarrassing to be unable to feed yourself without spilling the food – but it is. Any utensil that is designed to make life better for people dealing with problems is a design worth promotion in our opinion which is why the Steady Spoon is with us. A variety of situations can cause hand tremor and shake. Plain old age, Parkinsons, alcoholism, essential tremor and stress are all causes of the problem. The rechargeable battery, computer and sensors are housed in an easy to grip stabilising handle. You can attach the supplied soup spoon or at extra cost the optional fork, standard spoon or spork. Hand tremor is reduced by a significant extent – up to 70% is claimed by the manufacturer. 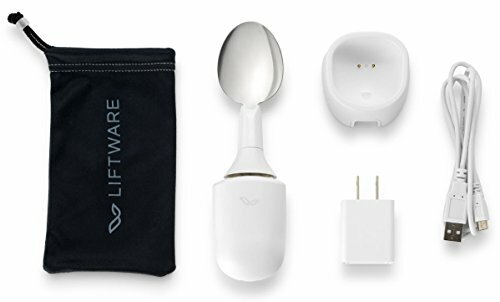 The Liftware Steady Spoon Starter Kit comes with an easy charging handle, mains charger adapter and charge lead, the unit itself with soup spoon attachment and a handy case for travelling. The Liftware spoon is suitable for mild to moderate hand tremor but is not designed for and cannot cope with extreme shaking. The additional spoon, spork and fork are optional accessories available at extra cost. You can never spill with this spoon. Perfect gift for babies or people with unstable hands. You can take it anywhere because it’s small. Its batteries last fairly long. Also has a soup spoon attachment.